The home is built to the highest standards and is what the glossy real estate magazines like to use to delight and impress their readers in the best of locations. With 1,000 feet of waterfront situated on St. Ann's Bay, the views through the lovely growth of maples will never cease to captivate, having been expertly landscaped for all seasons. Being almost 40 acres, the house becomes the standard bearer for comfort, charm and peace. The cathedraled great room, with fireplace centered for winter evenings, serves all year for congenial meetings and is reminiscent of classic European chateaus. The dining room continues that mode, nicely located between the gourmet kitchen and the great room, providing just the right social atmosphere. The views from all of the bedrooms complete the image and emphasize privacy with pleasing taste. There is a recently rebuilt wide full length verandah facing the bay designed to capture the sun as well as glimpses of the bay. An old orchard lies across the road on 35 acres which could be used for a wide range of activities including animals, vegetable gardening, a source of firewood, forest trails or development. The waterfront could support a wharf, or even a cantilevered deck, out over the rocky beach as a starting point for walks along the waters' edge or to enjoy the cool sea breezes. 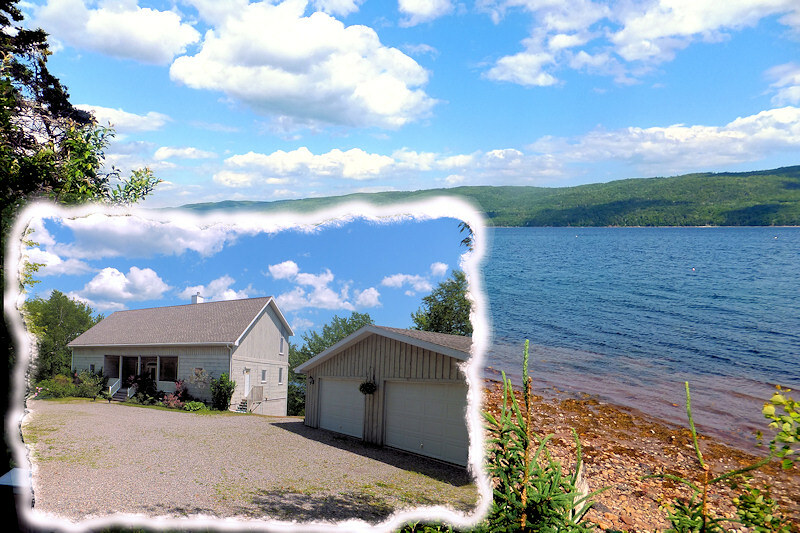 This is an unusual offering located in one of Cape Breton's most beautiful areas - St. Ann's Bay. Situated as it is, this property is an ideal place to enjoy living year round and can accommodate large or extended families with room for guests providing a quiet rural lifestyle a comfortable distance from urban intrusions. Only a portion of the property is subject to HST.  Property has 1000 feet of waterfront on St. Ann's Bay (salt water).  There is a wired-in generator located in the detached garage that is capable of running the essential appliances and furnace. The structure is specialty built by the Owen Sound, Ontario firm of Four Season Log Homes and includes the highly insulated, as well as attractive, use of one and half inch timbers to both sheath and interior wall the building. The nearly three inches of good quality wood provides beauty, weather resistance and insulation, surrounding and augmenting the fibre glass material in the core of the walls. Please note that the list price is below the assessment for the property done by the province. The price per square foot is a low $117. The price represents excellent value. Until several years ago, the owners operated a thriving B&B operation seasonally. The business records, including the repeat customer list, are available at no additional cost to buyers interested in the possibility of resuming the B&B operation. The business name is also available. HST registered entitities can mitagate the HST on the sale (applicable to 42% of the sale price) by getting a refund. From Baddeck up the Trans Canada to the turnoff for the Gaelic Collage, follow road to the civic sign. This site is a portal to the St. Ann's Harbour area communities. A surprisingly broad set of links and pages that cover everything from road conditions and ferry schedules (a necessary adjunct to St. Ann's residents) to community affairs, breakfasts, and other organized social meetings. Educational events, photo and artistic galleries, the Gaelic College, and more. 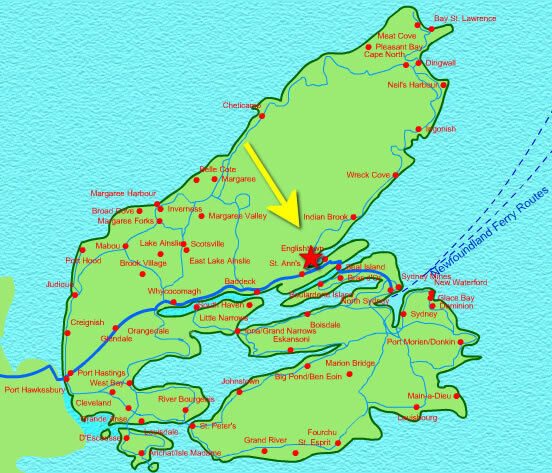 For the St. Ann's resident particularly, but also moves into broader areas from Baddeck to North Sydney, which includes the most accessible locales for shopping and services. Nice photo gallery of bay area. Lots of ads but easy to ignore. The Wikipedia page on this nearby community offers some area history(it is one of the oldest settlements in North America) and links. 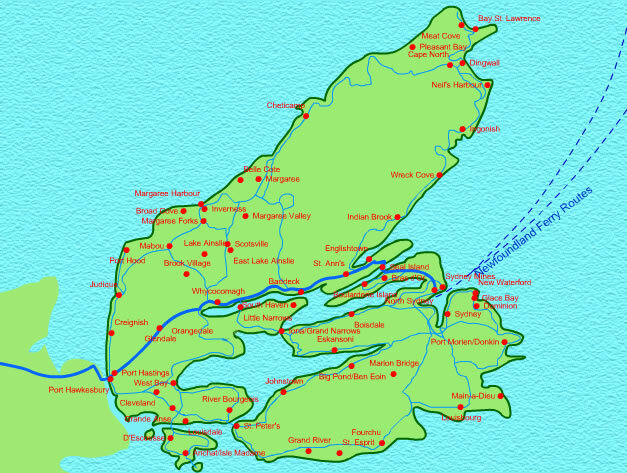 St Ann’s is a uniquely artistic community with artisan shops all along the way including: Singing Pebbles Pottery, Sew Inclined, Wildfire Pottery, Celtic Quilts, Glass Artisans and Piper Pewter. The area's claim to fame - all about the college and community. A collection of photos posted on the weather network. A gorgeous collection of photos of this picturesque area. Named after Baddeck's most famous past resident, Alexander Graham Bell, the Bell Bay Golf Club is a highly rated course. All appliances, complete list will be supplied after property is viewed. MAIN FLOOR KITCHEN NOOK 15' X 9' 6"
© 2005-2017 CapeBretonEstates.com. All Rights Reserved.